Well, golly gee, I wonder what kind of government Vietnam currently has? If you guessed 'communist' you'd be right! The background of the flag was inspired by the original red flag used by the Paris Commune in 1871. The color in this case, represents the goals of the revolution behind the national uprising in Vietnam. 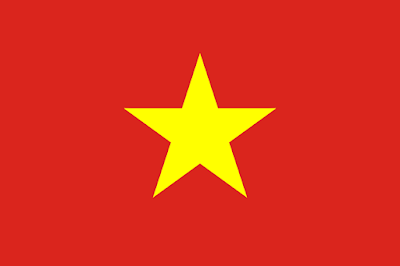 The star represents five main classes of people in Vietnamese society: intellectuals, farmers, workers, businessmen and military personnel. The flag was officially adopted on September 5, 1945 as the flag of North Vietnam. But the flag has been in use before that- as the Viet Minh had been using the flag since 1941, during their struggle against the Japanese occupation. The flag was used as the flag of North Vietnam until 1976, when it became the flag of a Unified Vietnam. However, in 2001, the Vietnamese Ministry of Culture said their was no evidence indicating that the leader of the failed uprising was the original designer of the flag. So that's pretty interesting. While it wasn't adopted officially until June 14, 1949, the original design was inspired by Emperor Thanh Thai in 1890 before being revived by Le Van De and re-adopted by Emperor Bao Dai in 1948. It was the flag of the French controlled areas of both Northern and Southern Vietnam from 1948 to 1955 and then the flag of the Republic of Vietnam from 1955-1975. It consists of a yellow field and three horizontal stripes of red. There are two accepted interpretations of this flag- the first is that the three stripes are for the unifying blood running through northern, central and southern Vietnam- the three 'regions' of the country. Or, the three lines could represent the symbol for 'south' using Daoist trigrams. Interestingly, it's still used widely in the Vietnamese diaspora and has been recognized at multiple levels of government in the United States as the Vietnamese Heritage and Freedom Flag. So, there you have it- the flag of Vietnam! Remember, until next time, keep your flags flying- FREAK or otherwise!